Not the usual type of product to feature on my blog but I wanted to tell you all about a product I've found in the last week. I suffer from really dry eyes and this combined with contact lenses and hours of sitting at a computer most days leaves my poor peepers feeling sore and dry. Over the years I've had SO many issues with dry eyes; to the point where I've actually given up with lenses for months on end. However, I don't feel myself when I have my glasses on and my current specs aren't in the best shape now (covered in scratches.... I need to invest in some new ones soon!) so I try to wear my lenses most days at the moment. Last week I had the bi monthly panic... "AHHH I have an eye infection.. lets rush to Boots to get checked out!" Of course...everything was fine and just a little dryness. I think my optician is getting used to this occurrence now and she begged me to get some drops and religiously use them.Now, like most people out there, I really can't stand using drops and I'm sure most of the actual drop doesn't even make it into my eye! So when I saw this product I was instantly interested! 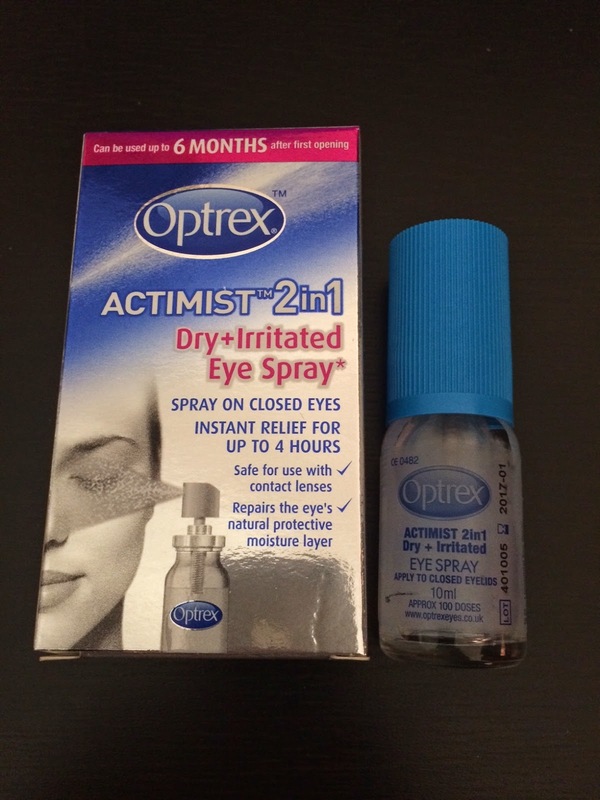 Optrex Actimist 2 in 1 is a spray that instantly refreshes and helps repair the natural moisture layer! Its a 10ml bottle that you can use up to 4 times per day. What caught my attention most was the fact it can be used whilst you have lenses in and it's also fine to use with waterproof makeup- I haven't experienced any smudging at all with gel liner! Once sprayed from about 10cm's away you should leave your eyes closed for 15-20 seconds.I notice the difference straight away, my lenses dont't feel sticky and I feel refreshed and ready to continue with my computer work. As well as hydrating my eyes it works on the skin around my eyes too! The bottle is a handy size to slip into my handbag. There are a few other sprays in the range for different symptoms, for example, itchy eyes! Check them out on the website. Hope this has helped anyone out there with the same issue!